Sozi is not responsible for rendering your document on the screen. This is the job of web browsers. Sozi only handles the presentation logic: applying geometric transformations to the layers of your document, controlling the animation, reacting to user input. If you find that some graphics are not rendered correctly, the issue is likely to come from either your SVG editor or your web browser. Please do not send us bug reports on this topic unless you have strong reasons to believe that the bug is in Sozi. If unsure, you can ask for advice on the Sozi community forum. [...] you should not use flowed text in documents that you intend to use outside of Inkscape. How do I set a background color? 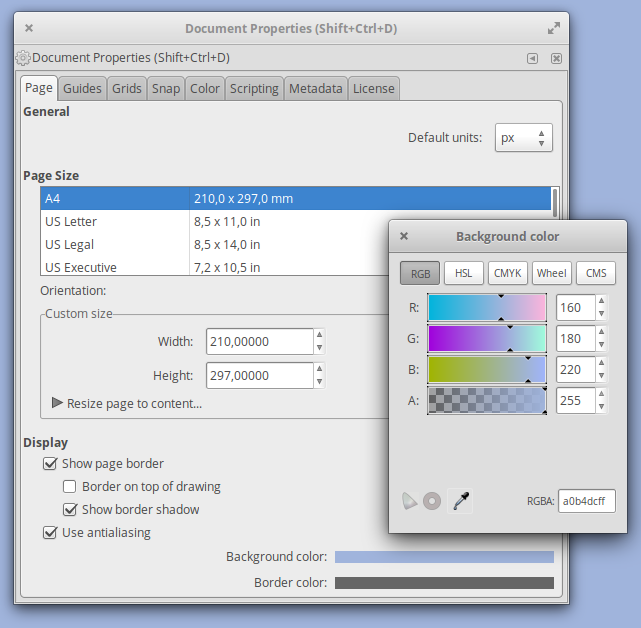 Inkscape allows to set a background color in the document properties dialog (File menu → Document properties → Page tab → Background color). Make sure that the Alpha (opacity) component of the color is set to 255. When you set a background color with Inkscape, Sozi will detect it and will generate an HTML document with the same background color. This property is specific to Inkscape and will be ignored by web browsers when you open the SVG document alone. Replace rgb(160, 180, 220) with your preferred CSS color. How can I remove the dashed outline around a focused hyperlink? If your document contains hyperlinks, you may notice that after clicking on a link, it gets surrounded by a dashed rectangle.